Sometimes a photograph can stop you in your tracks – you’re almost spellbound and its power deeply moves you. 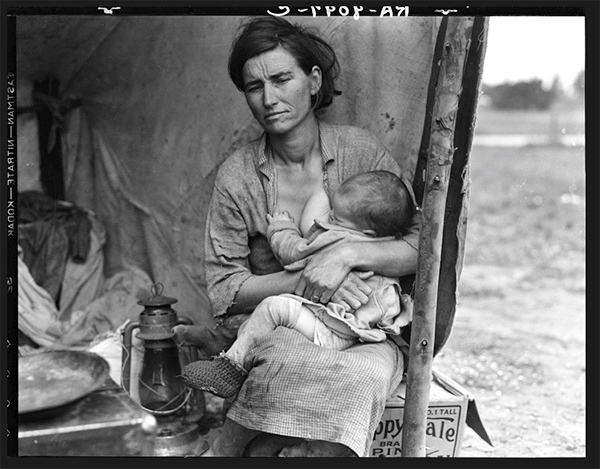 That’s how I felt the very first time I saw ‘Migrant Mother’ by Dorothea Lange. I hadn’t seen this photograph until well into adulthood, so perhaps its impact and meaning were amplified with more mature eyes and life perspective. 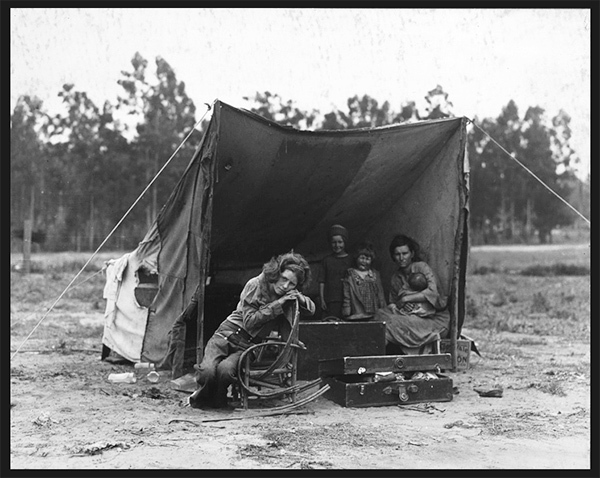 Impoverished, destitute and homeless, I could only imagine what suffering this family was experiencing. The look on the mother’s face embodied so many emotions; deep concern and worry, apprehension about the future, a wistful longing. Despair. Yet there was something more, a glimmer of hope and determination, a quiet dignity and stoic resilience, a heroic fortitude of the human spirit. I knew the photograph was taken in America during the Great Depression, but I was determined to learn more and began to look into the background and context of this compelling image. 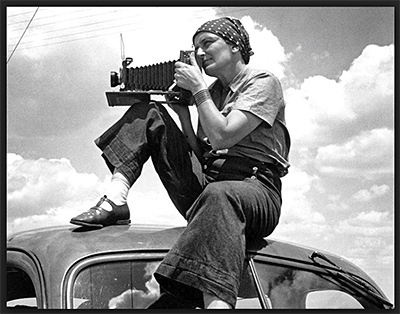 The author, Dorothea Lange (1895 – 1965) was a professional photographer contracted by the US Government’s Farm Security Administration to drive around California, documenting and raising awareness of the struggles of rural life and impoverished farmers. In early 1936, Lange came across the pea fields of Nipomo. The pea crop had failed and migrant labour camps were full of unemployed field workers whose livelihoods were destroyed. The now famous mother in the photograph was Florence Owens Thompson (1903 – 1983). Interestingly, Thompson’s identity was not revealed until many years after their encounter. 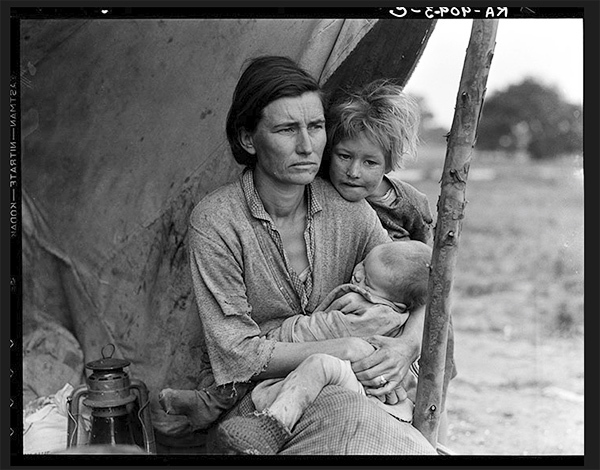 Although ‘Migrant Mother’ became the most well known and widely publicised image from this series, the other shots also convey the stark, desperate and unforgiving conditions in which Thompson and her family were forced to eke out a meagre existence. Upon finishing her assignment, Lange approached the editor of a San Francisco newspaper. 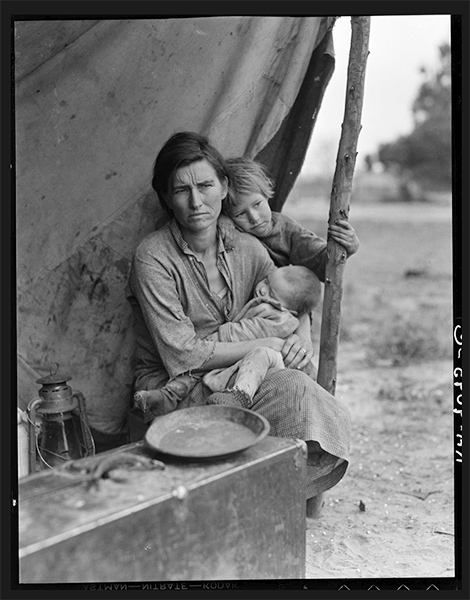 After presenting two of her images, one of which was ‘Migrant Mother’, the paper published an article featuring Lange’s photographs and the editor alerted federal authorities. As a result, the government dispensed 20,000 pounds of food to the families in desperate need. This iconic image immediately became a symbol of the plight and desperation of migrant farm workers during the Great Depression. In fact, the then Director of the Farm Security Administration, Roy Stryker, supported and advanced the collection of more than 270,000 images which were commissioned from numerous photographers throughout the country. The intention behind their collection and publication was to draw attention to, and increase public awareness of the adversity and hardship endured by displaced farming families and migrant workers. Having explored the history and context of this photograph, my appreciation has only grown; not only for its power as an individual image, but its power as a force and instigator for social change. I can’t help but feel now is also a critical time in our history when we need more Dorothea Langes and ‘Migrant Mothers’ to shock, motivate and inspire us all. ‘Tree’ (1943) by New Zealand artist Rita Angus is the fourth addition in my series of Blog posts where I fondly look back at the artwork which informed my youth and which still holds a special meaning for me today. 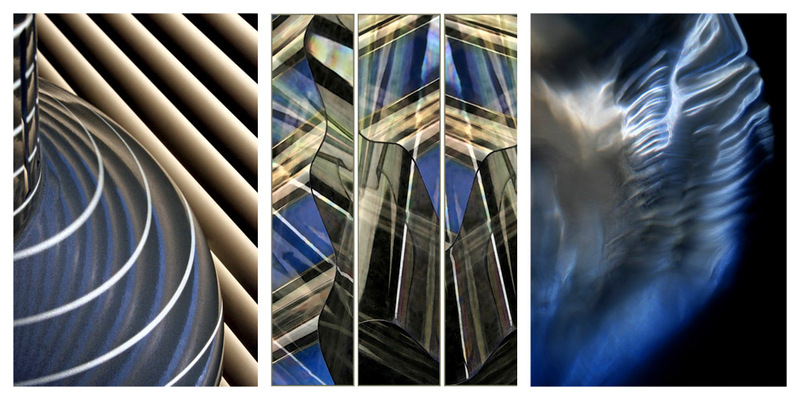 Simplicity and minimalism are qualities which I admire very much and have aspired to in my own photography. Perhaps this is why I’ve always felt such an affinity towards this painting. It says so little – yet says so much. There’s a stoic resilience, almost defiance in the solitary tree. Its presence is dominating, but only because it stands alone. Did it choose to plant its roots here or did its life begin by random chance, location decided by fickle fate? Angus presents her arboreal subject at its most vulnerable, leafless and barren, just like the landscape in which it survives. Winter has enfolded it in its hands and empty branches stretch forth searching for comfort and the first hint of Spring’s embrace. Yet interestingly, the tree is not alone. Despite the apparent isolation and remoteness, birds have alighted on its branches. There is a relationship here as these tiny visitors hop and dart from limb to limb in a delightfully engaging dance. It’s almost as if they’ve come to redeem our solitary figure – open it up to new possibilities and experiences and soften its loneliness. The birds may also herald the impending arrival of Spring and with it the promise of new growth and new hope. 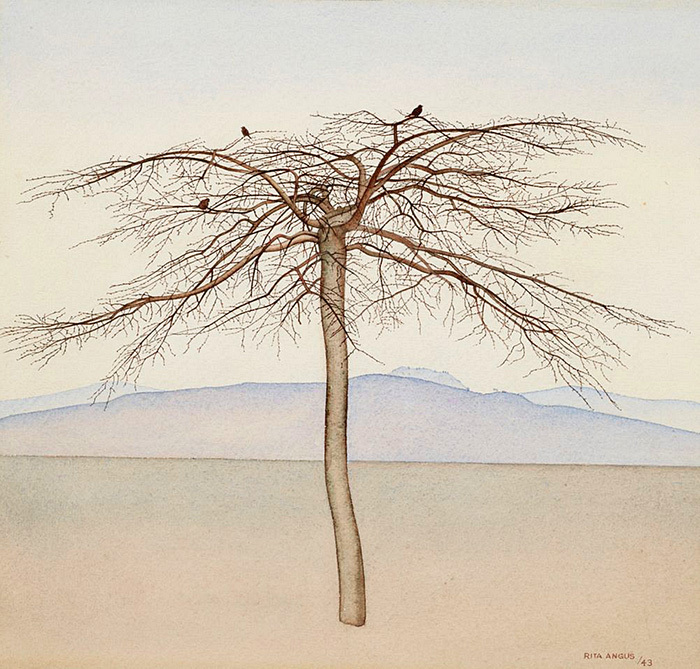 On first glance, ‘Tree’ may appear stark and ‘lifeless’ – bare branches, barren soil, austere hillsides. But if you look deeper, there is a paradoxical affirmation of life. Despite all adversity, one can stand tall with dignity, face what is to come and survive with the promise of a new beginning and a new tomorrow. If you’d like to read about other paintings which have a special meaning for me, please visit ‘Christina’s World’ by Andrew Wyeth, ‘Eleanor’ by Frank Weston Benson and ‘Luncheon of the Boating Party’ by Pierre-Auguste Renoir.